Last week we examined the largest wavelength in the electromagnetic spectrum: radio. This week we get a little smaller… but not too small! And look at the next step in the spectrum, the submillimeter. Astronomers have only recently began exploiting this tiny slice of the spectrum, but the payoff has been huge. Fraser Cain: We’re back in the swing of things. Last week we examined the largest wavelength in the electromagnetic spectrum – radio. This week we get a little smaller, but not too small and look at the next step in the spectrum – submillimeter. Astronomers have only recently begun exploring this tiny slice of the spectrum. The path has already been huge. Where can we find the submillimeter wavelength? Dr. Pamela Gay: When we talk about submillimeter astronomy we’re typically talking wavelengths that have a peak to peak distance of about point 3 millimeters out to about a few millimeters which aren’t necessarily submillimeter. We’re confined in what we can look at by our atmosphere. If you ask me to find the geography of where we can observe submillimeter I’d say go up. Go up really high. Fraser: Radio goes from meters down to a few centimeters to I guess a few millimeters. It’s such a huge difference. While some millimeter, a millimeter or two and you’re out again, right? Pamela: The thing to remember is there is a ton of differences in what lines you can see at each of these little fine gradiations. Just going from a few hundred nanometers say 300 nanometers out to 800 nanometers, you’ve now grabbed most of the light looked at by a typical visual telescope. That’s a very small region of the electromagnetic spectrum. Fraser: That’s true, who am I to complain about a few millimeters when the visible spectrum fits within nanometers? Pamela: Right so it is all about how much you break up the light. With submillimeter we still are able to break it up a lot within those small regions that we can measure on a meter stick basically. Fraser: The other side of the submillimeter is infrared? So we’re in-between infrared and radio? Fraser: Has it always been sort of considered its own separate wavelength? I guess we’ve got microwave too, right? Pamela: Microwave actually gets lumped in with the submillimeter a lot. What makes submillimeter what it is we have this tendency to break things up according to how hard they are to look at in some ways. So, we have visible light [Laughter] which we can see with our eyeballs. Infrared light which we can still detect with detectors very similar to the ones that we use for visual astronomy and snakes see in the infrared so that’s not all that different. Fraser: I get it though it’s like we can’t see it with our eyes therefore it is a different wavelength. It’s another region and the same with ultraviolet I guess? Pamela: Right and then when we get to radio. Radio is nice big blocky wavelengths that you can use nice big chicken grate detectors if you want to detect. Submillimeter, in the last show we mentioned that you have to have a surface perfect to within one part in 20 of the wavelength you’re looking at. With submillimeter dishes we need to be able to build in this case using technology similar to a radio dish. We need to be able to build it so that the surface of this radio dish has no imperfections that are even the size of someone leaving behind a dollop of metal the size of a strand of hair. Fraser: Then if I looked at a submillimeter telescope what would it look like? Pamela: It looks a lot like an overly massive radio dish. Because the surface has to be so perfect, they’re a lot more fortified than your typical radio dish. They are solid surfaces unlike radio dishes that often have big holes in them. Fraser: So it’s really like a cross between a mirror and a radio dish. It has the perfection of a visible light mirror but it sort of functions in the same way as a radio dish? Pamela: Exactly. Radio dishes you can pretty much stick anywhere and use any time of day. It is convenient that way. Radio light quite happily passes straight through the atmosphere, straight down to the surface of the earth, goes through clouds and doesn’t care if there is daylight. Radio is easy to detect. Anyone listening if they wanted to could go to Radio Shack and get all of the components to make a radio dish and go outside and detect Jupiter or check the center of the galaxy. With submillimeter though, we have to start worrying about the amount of water in the atmosphere because water molecules in the atmosphere are capable of blocking submillimeter light. You have to get yourself someplace exceedingly dry and you also want to be at a high altitude so you can get as much of the atmosphere as possible below you. Fraser: Once again it is very much the same techniques for putting together a visible light telescope top of a mountain, in the middle of Antarctica, or out in space. Pamela: It is even worse for submillimeter. We don’t actually launch them into space because there are things that we can’t observe from Earth at all but we do stick them on tops of mountains. With visible light, the atmosphere just smears the light out which is inconvenient but we can at least look through the atmosphere. With submillimeter light the atmosphere actually flat out blocks the light. We measure the amount of water in the atmosphere by how many millimeters of ocean it would make if you decided to take the entire atmosphere all at once and turn it into an ocean. If you have enough water in the atmosphere above the telescope to just make a sea 4 millimeters deep that can block out more than 50 percent of your light, more than 80 percent of your light at some wavelengths. We just can’t get the light through the atmosphere unlike visible where it is just blurred out and you’re sad. Fraser: So just to use sort of an analogy when you talk about the radio wave. You point your detector at some spot in the sky and you either get radio or you don’t have radio. It is very binary. Fraser: Does submillimeter work the same way? Pamela: Submillimeter works the exact same way. If you have a single dish you look at a single point. Fraser: Right, if it is working the same way you’re either getting your signal blocked by or decreased by water or not? Pamela: Yeah and that gets kind of frustrating. So, the best submillimeter telescopes in the world are in neat places at the tops of cool mountains. There is one in Spain called IRAM that’s actually the middle of a ski resort. Astronomers will be sitting there observing away and watching people ski past their telescope. That’s just amusing. Pamela: Yes it would. There is also a really good one out in Hawaii that is owned by Caltech and a consortium of universities. We’re also in the process of building as a community a brand new one in the Atacoma desert which is where the Very Large Telescope is located. Fraser: Let’s compare and contrast then the functions of a submillimeter telescope. We talked a bit about how the radio works. It scans the sky in a certain region and measures the strength of a radio signal but it doesn’t create an image. It is only by successive sweeps across the sky you actually build up an image. 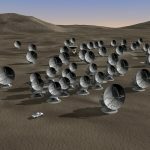 How does the submillimeter detectors work compared to it? Pamela: The submillimeter generally works the exact same way. When we combine multiple dishes then we can start to build an image all at the same time. But a single dish working with a single receiver at the same time, you get basically one pixel on the sky. There are detectors that are working to figure out to essentially multiple pixels. In general it is basically one dish one pixel. It’s when you combine multiple dishes and use interferometry that you’re able to build up simultaneously much more complicated pictures. Fraser: That’s kind of strange because infrared telescopes work the same way that visible light telescopes work. You point it at the sky and it can make an image. Pamela: It is a matter of we’re still trying to figure out how do you build the multi-pixel detector for a radio dish. We’re just not quite there yet. Fraser: I guess the most important question is why on Earth are we developing telescopes to analyze this teeny tiny part of the spectrum? Pamela: So we can look at lasers in space! Pamela: There are more reasons than that. You can use submillimeter to look at a bunch of molecules but one of the coolest things is there are naturally occurring microwave basically lasers. Lasers is light processes, microwave is a type of light. There are places in the universe where for a variety of different thermodynamic complicated reasons the electrons and the atoms end up in an energetically inverted state. You end up with a bunch of electrons that for a variety of reasons ended up at a higher energy level than they should be at if the system is in equilibrium. As these electrons cascade down to lower energy levels they met a laser beam and that’s just kind of cool. We can use this to study a variety of different environments. There is a classic pulsating variable star. They are semi regular we’re not entirely sure how they work called Mira stars. There was a lot of press about Mira itself a few years ago because as it is shooting through space it is leaving behind bits of its atmosphere and it is basically a stellar comet in some ways. In the atmospheres of these stars we actually get these maser processes taking place. We also find this in clouds of interstellar material. We can also use submillimeter to look at a variety of different molecules that we don’t see any other way. We’re just studying a different part of the cold molecular universe. Fraser: You said that it shoots off like a laser so wouldn’t we see that invisible light? Pamela: When I say laser it refers to the thermodynamics of the system. It refers to any system in which you end up with more excited electrons than non-excited electrons and a certain type of resonance where you end up with all of these electrons jumping to lower levels and emitting light. Fraser: Right but you’re getting a coherent beam of photons. Pamela: It doesn’t have to necessarily be a coherent beam but you have a coherent thermodynamic process that is releasing all of these electrons. When we make these things in the laboratory we end up with a nice coherent beam. The universe doesn’t generally shoot lasers like you see in Star Wars but it does have this coherent emission of light just like think of it at a spherical laser beam. Fraser: Then why is the submillimeter the great tool for looking at this? Pamela: Because the electrons and a bunch of different molecules just happen to have these transitions for the electrons occurring at energies that emit light in the microwave. The microwave is part of the submillimeter. It just happens that for instance silicon hydrogen molecules, a molecule with one silicon atom and one hydrogen atom happen to have a transition that creates a maser situation. It’s just a matter of some things emit things in colors we see with our eyes and some times they emit things that we see in the submillimeter. We have red lasers, green lasers and microwave lasers. That’s just one of the neat things about thermo is it allows all of these different colors to exist. Fraser: Just to reference last week’s show so you’re saying that if I kind of did the math as the electrons stepped down in their energy levels, they’re emitting these photons, right? Fraser: And the amount of energy in the photon relates to the submillimeter wavelength. Is that right? Fraser: If I look out into the universe in this very tight focused sort of part of the electromagnetic spectrum and I see a source that is bright in that then I can assume that this very specific process is going on thanks to the genius theorists who [Laughter] worked up the math to figure it out. If you see light at this very specific wavelength then that means that this interesting thing is happening. So what were the interesting things that were happening? We talked about Mira which is a pretty amazing star but what exactly is going on do you think? Pamela: It is basically a situation where you end up with the material is getting bathed in light of just the right temperature or color – we use them interchangeably – from some other source that it is bumping electrons up to a higher energy level. Lasers and masers have this weird you can’t just bump things up one energy level you actually need to bump them up a couple. Then there is a multi-decay process. It just happens to be that the light flooding this region is of the right energy to set up the population in the wrong set of energies. If you look at the temperature of the system, the electrons want to be at one energy level. Then you start hitting them with light and the light excites the electrons to a higher energy level. As they cascade down you can end up with this laser maser situation being given off. Pamela: It’s just a microwave laser basically. Fraser: It’s like mega-laser [Laughter] microwave laser. Pamela: There are people who are trying to change the terminology to mean molecular laser because any of these that are taking place in the microwave wavelengths are actually molecules doing the excitation. Fraser: Right, okay so that’s one thing that the submillimeter is good for. What are some other things that you might want to look at? Pamela: There are also different molecules in clouds of cool gas that are giving off their light in submillimeter. This is where we can start looking for formaldehyde in space just in case you want to go pickle something. We could also look for various carbon organic molecules in space that give off their light in cool clouds of molecular gas in the submillimeter. Fraser: The same deal here, we’re seeing electrons changing in energy levels and giving off photons in a very precise wavelength? Pamela: In general with molecules it’s not even the electrons that are jumping up and down levels. But because you have this system of multiple atoms working or bonded together I guess is the best way to put it, they can be vibrating. As the atoms vibrate, and they can also be rotating, so as the system rotates or vibrates in different ways it has different energies. If it changes from vibrating one way to vibrating another way like a string getting plucked a couple of different ways you can end up with different energies tied in and an electron being given off as it changes the vibrational or rotational energies. Fraser: It is amazing that we can see that and astronomers can know what they are looking at which of these situations they’re analyzing. Pamela: It gets to be really ugly math. When you take quantum mechanics they start off friendly and they say here is the hydrogen atom and you learn all about the transitions in the hydrogen atom. Then they make you sad by giving you the helium atom which is more complex. As you continue to take quantum they eventually hit molecules where you cry because you’re dealing with what’s the moment of inertia of different molecules. What are the vibrational levels of different molecules? It becomes very complicated very quickly. But we have the abilities if you chew through enough math and use enough computers we have the ability to figure out what are all of these different energy transitions. Fraser: Wow and so is there some stuff that is maybe closer to home? It sounds like a lot of that stuff is way out in deep space. You’re looking for clouds of molecules or anything useful here in our solar system. Is there any way to observe moons, planets, anything there? Pamela: Submillimeter is just the study of cold stuff basically. Comets are conveniently nice and cold. In looking at them in the submillimeter we’re able to trace out the nucleus of comets. We’re also able to look out at the small cold bodies in the outer solar system where for instance and I can never pronounce this poor small body’s name correctly or however you say the small thing that begins with a ‘q’ that is near Pluto. It is something that has been imaged in the submillimeter and we can use this to measure the diameter of these different cold bodies. Fraser: In this case we’ve got objects that are at that perfect temperature. They’re so cold that the radiation that they’re giving off is in the submillimeter. So it is the perfect gadget for finding those bodies out there. That’s pretty cool. Pamela: So while we see them in visible, we can see them and learn a little bit more about them in the submillimeter as well. We also use the submillimeter for other things. We can use it too to look at the envelopes of evolved stars. That’s what we’re doing when we look at Miras. We can also use it to study star formation. Fraser: Isn’t that a hot process? Pamela: Stars start off somewhere and they don’t start off particularly warm. Quite literally what’s cool is when you take a giant molecular cloud and let it begin to condense. You start to see the nuclei of stars forming or in this case the protostars forming as small points of heat that appear in the submillimeter. Fraser: Oh, so because they start out as completely cold clouds and then they start to form and start to heat up and then you’ll see them in the submillimeter. Then they’ll pass that and become hot enough where you’ll see it in infrared and eventually visible light when the star itself appears. Pamela: Right and we’re also using submillimeter to look at [Laughter] this is going to sound strange but at gamma ray burst afterglows. We’re able to provide some constraints on what is the physics involved in the system around the gamma ray burst as we look at it in a whole variety of wavelengths. We look at them in the gamma rays, in the x-rays, in the optical, in the infrared and in the submillimeter as well. It’s only by observing objects across all of the different colors of light that we can get a full physical understanding of what is going on in this system. Fraser: Just a last thing, I want to talk a bit about the hardware, the technology out there that does this. What are some of the observatories? If I’m reading the news or Universe Today for example, and I [Laughter] see an instrument or observatory mentioned what would sort of let me know that the trigger that okay that’s a submillimeter observatory? Pamela: It is kind of hard to know when you’re reading through a newspaper if you’re dealing with a telescope that can do infrared in submillimeter or submillimeter in radio and what wavelength it’s working at unless you read the details and happen to know which molecules give off light at which wavelength. Fraser: And if they mention the wavelengths in the article? Pamela: Some of the big facilities for instance IRAM in Spain which I already mentioned, the Caltech submillimeter observatory. They are working on building the brand new Atacoma submillimeter telescope down in the Atacoma desert. Herschel when it launches is going to be able to work in the submillimeter. We have the Antarctic submillimeter telescope. There are a variety of them scattered around the world. There are a variety of radio dishes that when push comes to shove can push themselves just barely into the submillimeter if they need to. The real neat experiment that is coming up is the Atacoma submillimeter telescope that is getting built slowly but surely and its first dish was actually delivered in December of 2008. It’s actually starting to show up out there. Fraser: It is interesting to see sort of as now astronomers are using more and more of the spectrum slices of it are getting a lot of attention. They’re getting dedicated instruments, dedicated observatories. They’re getting some serious attention which is great. There are some amazing new observatories. I don’t know if this has somehow turned into a tour of the electromagnetic spectrum. [Laughter] There is some really interesting stuff for x-rays and gamma rays. I think we could kind of try and mention that in the past there was sort of like telescopes that looked at light. Then they figured out there are radio telescopes. But now they’re really slicing it up and saying let’s just focus on this tiny little wavelength and let’s be able to draw the best science we can. Like you said make our force our big radio telescope to drive down into the submillimeter. Let’s make a really good submillimeter telescope that is finely tuned like a mirror, like a visible light telescope but can receive in that spectrum. It is just great the one in the Atacoma is going to be amazing and Herschel as well. Pamela: Herschel is going to be amazing. Pamela: But it is dedicated to one fairly narrow science. What’s amazing about the Atacoma Large Millimeter Array which is generally called ALMA is this is a major international project with the UK, the European Southern Observatory, the Japanese National Astronomical Observatory and the U.S. National Radio Astronomical Observatories all working together building in fact three different types of receivers and transporting them out to a desert plateau. You really don’t get more difficult than getting many ton instruments to the middle of nowhere. This truly defines the middle of nowhere. Fraser: Right and if it was a big radio telescope you could tweak it a little. These have to be kept very, very perfect, moved carefully. Pamela: It is a huge number of dishes and it is going to be years putting it all together. Pamela: Yeah, once they get these 50 to 60 different antennas all installed out on the plateau the universe is ours to observe. Fraser: No kidding, it’s going to be a monster. That’s great. Well, thanks a lot Pamela we’ll talk to you on the next show.